Southwest Soup is a recipe every busy person should have Pinned on their dinner board. It’s a quick and easy meal that everyone in the family will love. 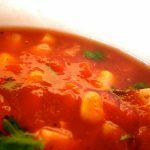 Southwest Soup takes just a few minutes to put together and can be made in the crockpot as well as on the stove top! We are huge lovers of anything with Southwest/Mexican flavors in our home. I’m game to eat tacos or enchiladas several nights a week. In the winter, I’m a big time soup fan. Soup every night is okay with me…Especially soup topped with cheese, sour cream, avocado and tortilla chips. It’s like giving yourself a license to eat liquid nachos. Any meal that takes less than 30 minutes to make and ready to serve is a winner in my book. Southwest Soup is a less than 30 minutes meal. My dear friend Sara gave me this recipe years ago, when my kids were all still at home, and mid week meal time often meant- grab whatever is edible before running out the door to the next event! You know how that goes… Serving something that was filling and semi nutritious AND also appealing to kids and adults was always a challenge. Add on a meal that was simple to prepare and it almost seemed like the impossible task at times. This meal is one of the most simple I made back then, and still make now. Everyone loves it and it’s a perfect meal for new neighbors, friends with new babies, not to mention those nights when you need dinner and have 15 minutes to get it ready. I love this recipe because it can be made on the stove top, or cook the chicken and throw everything in the slow cooker for the day on low (instructions on recipe). At dinner time, make a little buffet with toppings and you’re the best mom (or dad). EVER. Place olive oil and chicken in a dutch oven or large pot over medium to medium high heat. Sprinkle with red pepper flakes, salt and pepper. Cook for about 8-10 minutes, covered. When chicken is done, reduce heat to medium and add minced garlic and cook for another minute. Remove chicken from pot and shred or chop into chunks. Place chicken back in pot, squeeze lime juice over chicken. Add rest of ingredients to chicken and let simmer until hot. Serve with additional cilantro, sour cream, grated cheese, chopped avocado and tortilla chips. -Slowcooker instructions:Cook the chicken on low, seasoned with salt, pepper, red pepper flakes and garlic for about 3 hours, no need to add olive oil. When chicken is cooked, shred or chop. Squeeze lime juice onto chicken. Add remaining ingredients and cook on low until ready to serve. -You may use frozen boneless, skinless chicken breasts without thawing. Place the chicken in a single layer in bottom of slow cooker and follow instructions above. Remove juice from slow cooker before adding other ingredients (optional). The juice may become cloudy from chicken fat and change the appearance of the soup. I usually advise to use the broth that is cooked off from the chicken, but in this recipe I don't like the way it looks in the soup. That does sound delicious! I am so done with all of this snow. I'm tired of freezing all of the time! I made this but used regular canned tomatoes since I was out of crushed. It was OK but I think the richer flavor of the crushed tomatoes would make it better. I liked how fast and simple it was to make. It was great with cheddar jalapeno cornbread! Question: For both methods, you don’t cook the chicken in the chicken broth, right? You are pan-frying the chicken in the stovetop method, and cooking the chicken breasts without any liquid in the crockpot method, correct? Correct! I cook the chicken in a little oil on stove top is using the one pan stove top method, and in the slow cooker, just place the chicken in the slow cooker as directed. No liquid needed.